Well hello! Long time no chat! Caroline and I took a little hiatus over the summer and I am feeling the need to restart the baking goodness! 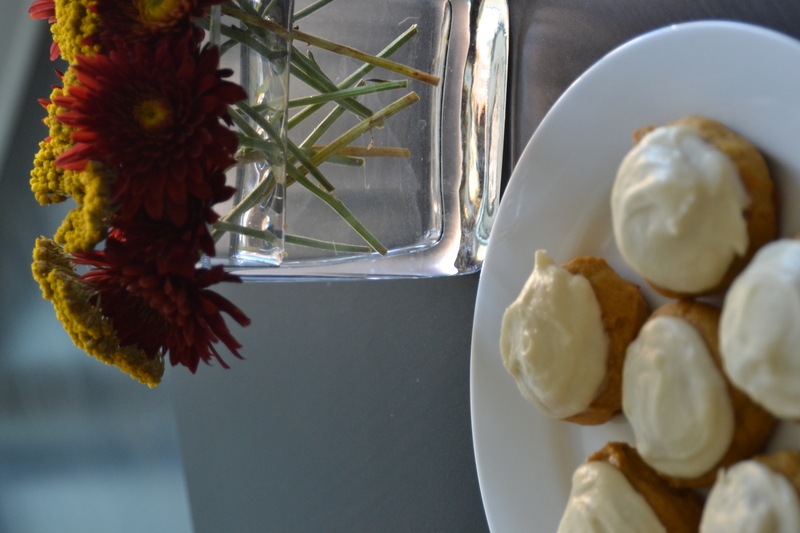 And what a better time of year to start things fresh than Thanksgiving weekend and a new pumpkin treat! Our family didn’t get to have our turkey dinner this weekend as we were spread out across the province with busy work schedules. So I was here in Ottawa and celebrated Thanksgiving with some of my new family! Unfortunately, Neil had to work and he had asked me to bake him some cookies. I figured a festive fall cookie was in order. I found this recipe that looked delicious! 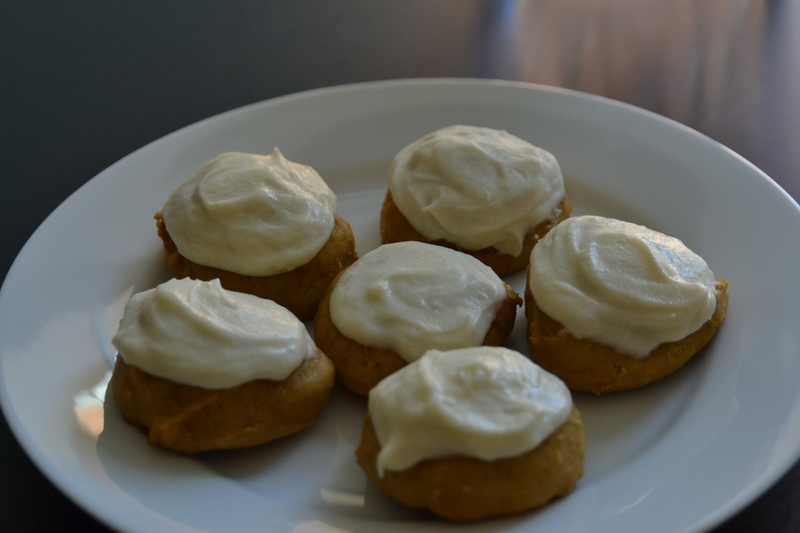 The cookies were super easy to make and they were done in 12-13 minutes. The frosting was delicious and I may have had a few spoonfuls from the bowl when I was done frosting them all. I made this recipe last week for the bf’s birthday. When I first saw this recipe in The Hummingbird Bakery Cookbook, I knew this was the perfect birthday treat for him. 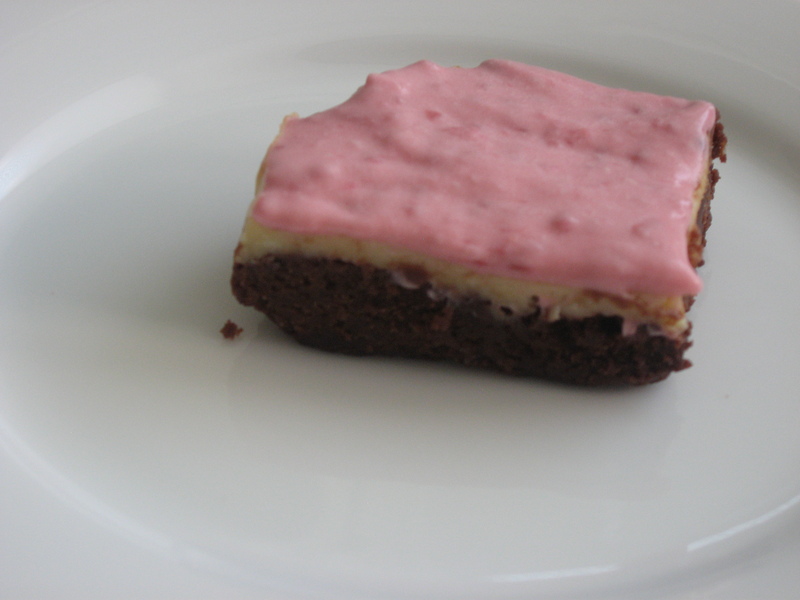 It combines 3 of his favourites, brownie, cheesecake and raspberries. Plus it is easy to cut up and take to work (or if you are the bf, eat for breakfast!). Once again, I was not disappointed with The Hummingbird Bakery. This recipe was so tasty and the bf said this was a “make-again” recipe, which is a definate sign of success:) Even though this recipe has 3 layers, it was fairly quick to make and didn’t use a lot of ingredients. I halved the recipe because a 9X13 pan seemed a little big! 1. Preheat oven to 325 degrees. Line 33 x 23 x 5 cm baking tray with greaseproof paper. 2. For the brownie: Put the chocolate in a heatproof bowl over a pan of simmering water (do not let the base of the bowl touch the water). Leave until melted and smooth. Put the butter and sugar in a freestanding electric mixer with a paddle attachment and beat until all the ingredients are well incorporated. Add the eggs one at a time, mixing well and scraping any unmixed ingredients from the side of the bowl with a rubber spatula after each addition. Gradually beat in the flour, mixing well after each addition, then turn the mixer up to high speed and beat for a little longer until you get a smooth mixture. Slowly pour in the melted chocolate and mix thoroughly. pour into the prepared baking bray and smooth over with a palette knife. 3. For the Cheesecake: Put the cream cheese, sugar and vanilla extract in a freestanding electric mixer with a paddle attachment and beat on slow speed until smooth and thick. Add one egg at a time, while still mixing. Scrape any unmixed ingredients from the side of the bwol with a rubber spatula after each addition. The mixture should be very smooth and creamy. The mixer can be turned up to a higher speed at the end to make the mix a little lighter and fluffier, but be careful not to overmix, otherwise the cheese with split. Spoon on top of the brownie and smooth over with a palette knife. Bake in the preheated oven for 30-40 minutes, or until the cheesecake is firm to the touch and light golden around the edges. The centre should still be pale. Leave to cool completely, then cover and refrigerate for 2 hours, or overnight if possible. 4. For the cream topping: Put the cream, sugar, and raspberries in a freestanding mixer with a whisk attachment and beat until firm but not stiff. Turn the brownie out onto a board and turn the right way up. Spread the topping evenly over the brownie and decorate with more raspberries. I asked Claire if she wanted in on this week’s TWD and she wasn’t game so it fell to me. I am glad it did because this recipe was super easy and delicious. I made a few changes including switching up the fruit. 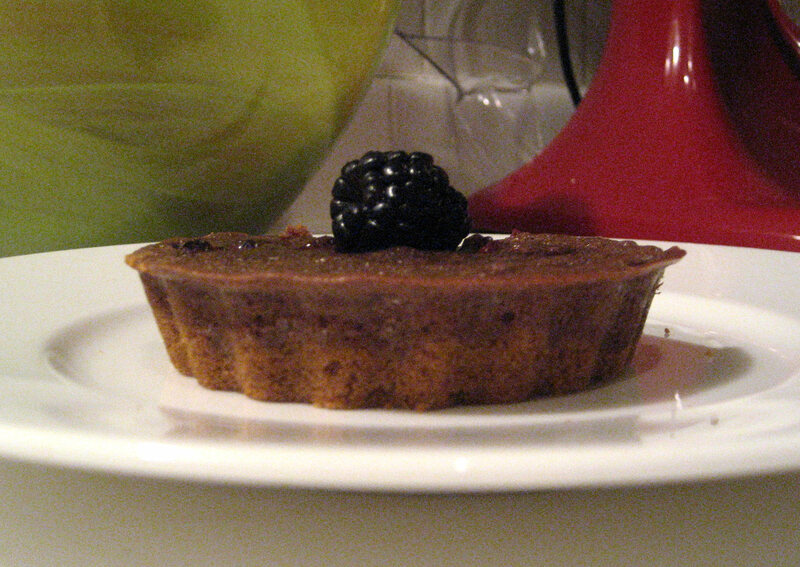 I chose blackberries because they are tasty and were on sale;) Given that the last thing I needed after the b-day party extravaganza was more dessert, I halved the recipe and made it for S. He has this thing for graham crusts so that’s what I used instead of the pastry crust. I was prepared not to like this dessert but I was pleasantly surprised and S. really enjoyed it as well. Why do I doubt Dorie? Thanks to Rachelle of Mommy? I’m Hungry for today’s selection. 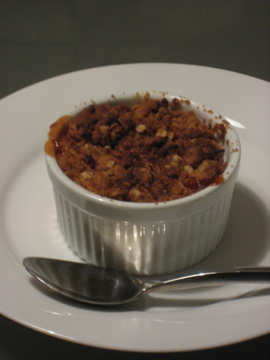 Head on over to her blog for the recipe or check out the TWD blogroll to find a new favorite blog. Last week was my friend Rebekah’s birthday. Since I was working that day and until midnight the night before I was trying to think of something to bring over with me that evening that was quick and yummy. One option was the choco-hoto-pots that Caroline posted but I figured I would make something new that hadn’t been posted yet. I got this recipe from Caroline and she grabbed it from here. The thing I love about this dessert is the marshmallow centre! It is a nice little surprise:) I’m not entirely sure after making them for a second time if I love them as much as the choco-hots-pots but I do think these are a fun dessert. Over low heat, stir chocolate chips and butter until melted and smooth. Remove from heat and whisk in sugar, eggs and vanilla until well blended. Stir in flour. Fill 6 buttered ramekins halway. Press marshmallow into centre. Spoon remaining batter and cover completely. Bake at 350F for 12-15 minutes (tops should be puffed and crackly). Let cool for 10 minutes. Run knife around edge and invert. Top with powered sugar. It seems like forever since I have posted a Tuesdays with Dorie recipe but I’m glad to be back! To be honest, some weeks it is hard to bring myself to make something I know will go to waste because my friend/family base here in Ottawa is just a bit too small! Plus, there have been the weeks where I am lacking a tool required to make the treat! So even though I have yet to get the food processor (well actually, it is at home waiting for me open it up on Christmas day, Thanks mum! ), I sucked it up and whipped up 1/2 a batch of this festive fall dessert for me and the bf. Oddly enough, I have never made a crisp before but I loved this and was happy to find out how easy crisps are! I loved the coconut in the topping and I think I will experiment with other fruit in combo with the apples. Maybe some raspberries? Or some caramels like Anne Strawberry! Our mum doesn’t like pumpkin and therefore it wasn’t until about 3 or 4 years ago that I discovered pumpkin. It all started with Starbucks of all places, at Christmas of all times. Caroline and I were in the middle of some boxing day shopping and we stopped for a drink and decided to try the pumpkin scone. It was delicious and so began my appreciation for pumpkin (though I’m still not a big fan of the pie). Caroline mentioned in the last post that she had some more yummy recipes to bring you from the can of pumpkin she opened. Last weekend when we were home for Thanksgiving I enjoyed the squares she made and had planned on bringing some home with me. But of course, I forgot the box of goodies. So I decided to whip some up with some pumpkin I had in the freezer. I brought them to work and they were a hit. Even one of the pharmacists who seems to have an “allergy” to many foods asked for the recipe! I have made these squares a couple of times now and have requests for more. I only ever make them in the fall but I think I might start baking them other times too! Poor pumpkin, it gets forgotten for too much of the year. The recipe can be found here. Thanks to Martha Stewart and I would suggest you make these in the coming week or two as a Halloween treat! I didn’t make any changes other than a few less chocolate chips but when Caroline made them she used mini chips and that worked well too! This weeks recipe was chosen by Jayma of Two Scientists Experimenting in the Kitchen. Since Caroline is away with my mum and our auntie for the week, this weeks recipe was mine for the testing. If you have been following our blog for a while, it seems that I have done most of the brownie recipes. So I guess that means I am becoming an expert on the Dorie brownie. I was pretty excited about this recipe because these brownies are super cute! I was originally not going to put the orange in but then I decided.. Terry’s chocolate orange is so good, why wouldn’t it be good in my brownie? Well I’m not sure if I just had a particularly large orange and therefore had too much zest or if I’m just not in love with orange in my brownies, but the orange didnt’ do anything for me. However, I must say I was once again pleased with Dorie’s brownie recipe. Since I am still struggling to figure out my apartments oven, I was happy to have a properly baked brownie and that was still moist but not too moist:) I would definately make this recipe again and just leave out the orange. I must also confess that the white chocolate thing didn’t turn out so well but whatever, they still look cute! I think next time I might even put a real chocolate button on top:) Thanks to Jayma for picking this weeks recipe and you can head on over to her blog for the recipe. It’s summer time in Ontario and despite the fact that we haven’t had great weather (great to me=30 degrees or hotter) we are in the midst of raspberry season. My friend Lisa and I started our vacation with berry picking and jam making. While picking our raspberries we decided that pavlova was the only option for the evening’s dessert. I used my mom’s pavlova recipe and she assures me that although other recipes call for cornstarch and vinegar, these are unnecessary additions. (This is according to her good friend Mary, a cookery expert in the North of Ireland). Preheat oven to 275 degrees. Beat egg whites until soft peaks form. Gradually add sugar beating until stiff and glassy. Fold in vanilla. Cover a cookie tray with foil. Spread mixture on foil in an 8 inch circle. Ensure that the outer edges of the pavlova are peaked and thicker than the middle. This will create a lip around the edge of the pavlova that will contain your filling. Bake at 275 for 50-60 minutes. Turn off heat and allow to stand in the oven for at least 1 hour. Transfer the pavlova to a cooling rack. When cool remove from aluminum foil and place on serving plate. Just prior to serving, prepare whipped cream and spread on top of the pavlova. Place your favorite berries or fruit on top. Enjoy. Note: You can play around with the pavlova, making it into a rectangle or creating individual pavlova servings. Unadorned pavlova can be wrapped well and frozen for future use. This weekend has been all about paper writing for me. I am on page 16 which is pretty good considering. One of my friends wanted to stop by for a visit and given that he had just broken up with his girlfriend I figured a home baked dessert was called for. 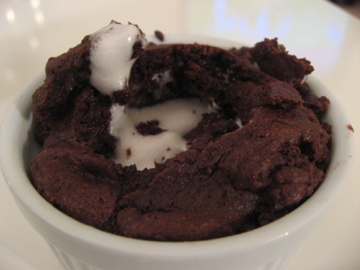 Given the lack of time for fancy recipes I fell back on an old standby, Nigella’s Choco-Hoto-pots. Melt the butter and chocolate and set aside. Mix up the eggs, sugar and flour. Add the chocolate mixture once cooled and mix together. Add the white chocolate chips. Bake at 400 for 20 minutes in buttered ramekins. Tops should be shiny and cracked and underneath it should be nice and gooey. As there were only two of us I halved the recipe and since I didn’t have any superfine sugar I just food processed some granulated sugar. Yummy Chocolate goodness.